The Metal scene in Portugal was consolidated in the 90s, after the name of MOONSPELL became known by Metalheads around the world. This fact turned the attentions to the country, and we all could see the treasures that Lusitanian lands got on those days. Actually, there are many very good names there, and in all Metal genres you can think of. But there are those that are good, but without showing outstanding works. 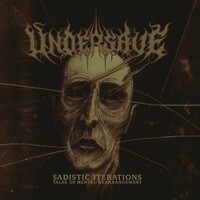 The veteran quartet UNDERSAVE, from Lisbon, is one of them, as their new release, “Sadistic Iterations…Tales of Mental Rearrangement”, their second album. Brutal and aggressive in a furious Death Metal onslaught, the quartet is heavily influenced by Floridian Death Metal School, but bearing a good technical insight. Let me tell you: they aren’t as brilliant as some names as CANNIBAL CORPSE, and aren’t creating something new either, but they are pretty good on the art of ripping through our ears with the harsh and oppressive music. Be prepared to be smashed! The recording sessions of “Sadistic Iterations…Tales of Mental Rearrangement” were a smooth time for the band, because the sound quality is really what they need: brutal and aggressive, with traditional Death Metal tunes, bearing the weight and crude feeling that their music demands, but guided by the idea that they must be understood, so the sound clarity is really in a good level. It’s not a perfect sound quality, but it’s truly good. The only thing I have to say that they must think about is the time. The songs are all extremely long for Death Metal, so on the next coming, they could be a bit shorter. And their massacres called “Press With Both Hands Hold Your Breath and Collapse” (fine work from bass guitar and drums on the rhythmic changes of tempos), the excellent bitterness of the slower parts of “Peacefully Floating in Prosperous Abyss” (very good guitar riffs are presented), and “Dead Up High, Persist and Be Smashed”(the grunted tunes are very good, as the broken tempos will remind a lot something that we heard on “Blessed are the Sick”, but without being a copy of it). Of course, these veterans (that are on the scene since 2004) have more to offer than what is presented on “Sadistic Iterations…Tales of Mental Rearrangement”, but it’s a matter of maturing a bit more and the presence of a good producer can give them the right help to UNDERSAVE to become a Portuguese Death Metal juggernaut in the future.